The Jericho Covered Bridge carries Jericho Rd. across the Little Gunpowder Falls 0.24 miles southeast of Jerusalem Road, between Baltimore and Harford Counties. 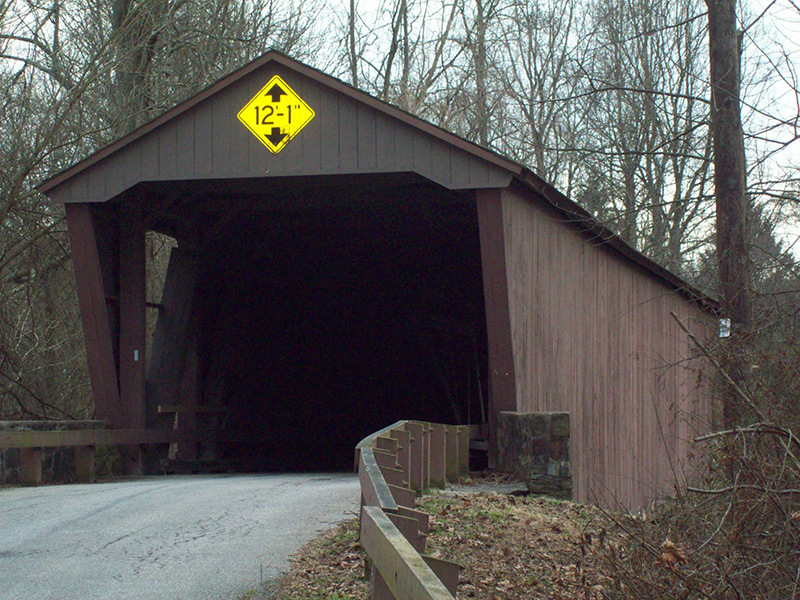 It is a Burr arch through truss design, a style credited to Theodore Burr (1771-1822) from Torrington Connecticut. In February of 1864 citizens of Harford and Baltimore Counties signed petitions requesting a bridge be built across the Little Gunpowder Falls. The petitions were brought to the General Assembly on the 24th of February of that year by Harford County’s Mr Hitchcock of the House of Delegates. and by Baltimore County’s Dr. David Sterett Gittings. Advertisements for proposals appeared on the local papers June 17, 1865. On July 5, 1865 the contract was awarded to Thomas F. Forsyth in the amount of $3125. It also showed that Hugh Simms was appointed to superintend the building (Hugh Simms owned the Franklinville Cotton Factory). By December 5, 1865 the Bridge was complete.